Partnership With Native Americans (PWNA) is recognizing National American Indian Heritage Month by honoring Native American students and the connection between history, education and heritage. Join us from November 1 through 15, 2017 for daily prizes and a Native education quiz. Winners will be announced every weekday. View our complete contest rules and visit us daily for the next chance to win. PWNA, through its American Indian Education Fund (AIEF) program, awards scholarships to undergraduate and graduate students annually. This Heritage Month, we are also awarding laptops to 5 freshman students who are AIEF scholarship recipients. Check back daily on Nov. 1, 2, 3, 6 and 7 for updates on our daily winners. Roselynne is from the Rocky Boy Reservation in Montana. 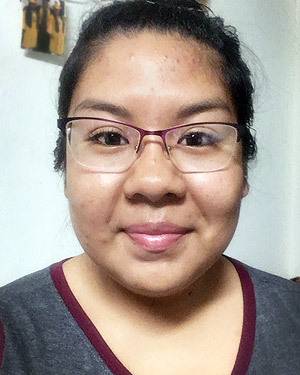 A freshman at a Montana tribal college, she is pursuing a degree in Native American Studies and then a master’s to teach at the college level and inspire others as a person and a leader. Roselynne was inspired to Native studies by Virginia Allery, Ph.D., who taught the subject at the tribal college in Roselynne’s home town. “How big our culture plays in our lives, I think that’s what grabbed my interest in this field,” Roselynne told us. Andrea is from Zia Pueblo in New Mexico. A freshman at a Kansas University, she is pursuing a degree in Elementary Education and hopes to return to her home reservation after college to teach the children and prevent high dropout rates. She feels that as a tribal citizen keeping the tradition and culture alive in her community is important. Myah is from the Cheyenne River Reservation in South Dakota. 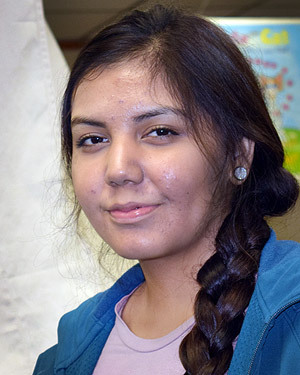 A freshman and first-generation student, Myah is a direct descendant of Lakota Mnicoujou Chief Tasunka Luta (Red Horse). She is studying Political Science and American Indian Studies. Deedra is from the Navajo Nation in New Mexico. 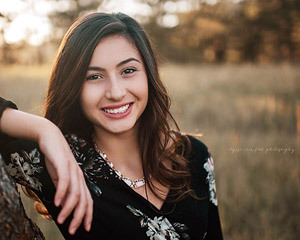 A freshman and first-generation student, Deedra was inspired to attend college by her mother and father and the daily challenges they continue to face. She told us, “The way I look at my future, I want to do more for myself by getting an education, and then bring back to my parents my accomplishments.” Deedra is pursuing a degree in Biology, and then planning for Pre-Med and will ultimately become a doctor so she can give back to her community that which has been given to her. View our complete contest rules and visit us daily for the next chance win. 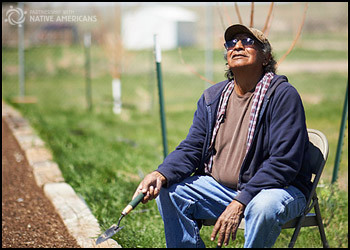 There is a gap or disconnect between public perception of Native Americans and the realities on the reservations, including realities related to Native education. We hope you find it enlightening as we address some of these misconceptions through our American Indian Education Quiz. Please register on this contest page to participate on Nov 8, 9, 10, 13 or 14, and you’ll be entered for a chance to win the daily drawing. Question 1: Why does attaining a college degree mean more for Native American students? a. About 50 percent of Native American students graduate from high school. b. 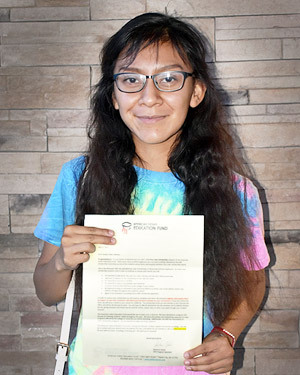 Native American students receive a free ride (full funding) for college. c. Native American students are often the first in their families to attend college. 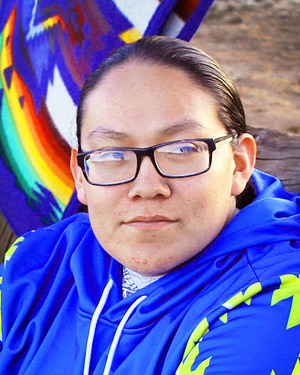 d. Many Native students believe college is not an option for them. Congratulations to Linda H., the winner of the giveaway for a framed, 16x22 “Mother and Daughter” print by Cree artist Betty Albert. Question 2: Why is the freshman year of college more of a challenge for Native American students? a. Unexpected expenses impact a student’s ability to stay in college once they’ve started. b. Off-reservation colleges lack cultural understanding and inclusion for Native students. c. Bureau of Indian Education schools are underfunded. d. Many Native students have never lived off-reservation prior to college. Congratulations to Carla M., the winner of the giveaway for a “Our Spirits Don’t Speak English,” DVD with Cherokee actor Gayle Ross about Indian boarding schools. Question 3: What one experience is most unique to Native American students in the U.S.? What one experience is most unique to Native American students in the U.S.? a. Many Native students live or have lived on a reservation. b. Many Native students practice the traditions of their tribe. c. Many Native students attended boarding schools. d. Some Native American students did not attend school. Congratulations to Jessica P., from Chicago, IL, the winner of the giveaway for the Navajo hand-made 6-inch dream catcher and medicine wheel. Question 4: What is the average cost of back-to-school supplies on a reservation? What is the average cost of back-to-school supplies on a reservation? a. School supplies on the reservation cost 3 times more than supplies in off-reservation stores. b. Sometimes school supplies don’t cost anything in a reservation community, because there is no local store that sells them. c. Native American students receive school supplies for free under the treaties. d. Sometimes families buy food or gas instead of school supplies, due to budgetary limits. Congratulations to Debora P., the winner of the giveaway for a boxed DVD set by PBS titled “We Shall Remain,” on Native American history. Question 5: Why are education and heritage connected for Native American students? Why are education and heritage connected for Native American students? a. Many Native students pursue a college education in order to help their communities. b. Native students want to make their families and community proud. c. College education is a good way to compete for the limited jobs on the reservations. d. College education means greater recognition and contribution to society at large. Congratulations to David J., the winner of the giveaway for a hoodie designed by PWNA and commemorating American Indian Heritage Month. View our complete contest rules. Nov 08: Today’s giveaway is a framed, 16x22 “Mother and Daughter” print by Cree artist Betty Albert. Nov 09: Today’s giveaway is “Our Spirits Don’t Speak English,” a DVD with Cherokee actor Gayle Ross about Indian boarding schools. Nov 10: Today’s giveaway is a Navajo hand-made 6-inch dream catcher and medicine wheel. Nov 13: Today’s giveaway is a boxed DVD set by PBS titled “We Shall Remain,” on Native American history from a Native perspective. On Nov. 15, 2017, PWNA will giveaway the “American Indian Christmas” CD to a lucky winner. This beautiful and inspirational music is by Native American artist, Jana Mashonee. Learn more. The winner will be selected, through a computerized random drawing, from a list of names for everyone who registers on this contest page between November 1 through 14, 2017. Update: Congratulations to Felicia H., the Grand Prize winner of the “American Indian Christmas” CD by Native American artist Jana Mashonee. The giveaway registration is closed and all winners were selected. Register to receive email updates for future giveaways and learn more about PWNA.